In installment number three of our ongoing Round Table Review series we take a look at the new album ‘Arrivals & Departures’ from Texas natives The Calm Blue Sea. The album is the band’s first release in four years and the follow-up to their debut self titled in 2008. Before we began, Postrockstar gives a huge thanks to the band and their label for offering this album to our writers free of charge so that we could complete this Round Table Review. ShanexEdge – Let’s face it, when any post-rock band releases a record, it’s going to get compared to the heavyweights of the genre. That’s a given, really, in almost any genre. The Calm Blue Sea, hailing from Austin, TX, get it two-fold, as they share their hometown with genre titans Explosions in the Sky. While I can understand making the comparisons, since both bands (and many others) are big fans of the build-up, I don’t think it’s really fair. 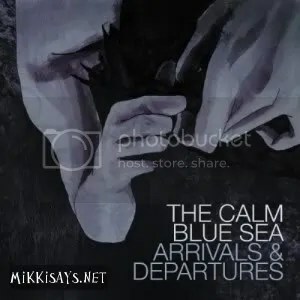 On their newest release, ‘Arrivals & Departures’, The Calm Blue Sea have delivered an album that, while carrying familiar elements of post-rock, really sets them apart from a great deal of their peers. Sure, the build-up is ever-present, but it’s delivered in a way that strikes me as more cinematic than anything else. This isn’t really a stretch for the band, considering that between the release of their self-titled debut album, and this one, they wrote a score for the 1924 silent film Siegfried, performing it live in a one-off showing off the film in their hometown.